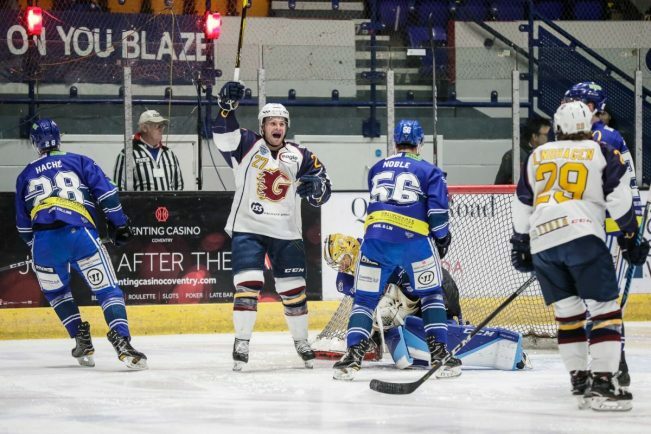 SWEDISH duo Carl Ackered and Eric Lindhagen both scored twice to help the Guildford Flames to a 6-3 victory over Casino Coventry Blaze at the Skydome Arena. Following a stoppage to clear blood off the ice after a wayward stick broke Coventry defenceman Chris Joyaux’s nose, the Flames re-grouped and took a second lead. TJ Foster shooting from out wide, the puck tricking through Wiikman and just over the line for 2-1 (33.43). On the powerplay, Ackered’s second of the night and his 9th in 18 league games made it 3-1 (35.08) to end 40 minutes. Two quick goals in the third all but put an end to the contest, with Kruise Reddick (40.11) and Eric Lindhagen (40.35) chasing Wiikman from the net, replaced by Brit Jordan Hedley. Lindhagen doubled his tally on 53.58 before Blaze’s Kelin Ainsworth registered a consolation effort on the powerplay (56.12) for a final score of 6-2. Head coach Danny Stewart said: “I thought the first 30 minutes was back and forth and we were right there but unfortunately we just made to many mistakes and gave them too many chances.